MPLAB® X IDE allows its windows to be easily moved and re-sized. Occasionally, a window may be put into a location that is hard to find. MPLAB X IDE provides a command to restore all the window locations to a default state. The IDE will restore the windows to default installation location and size. 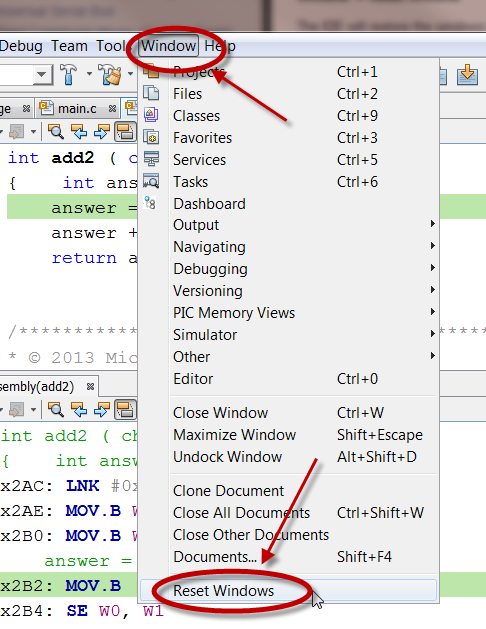 MPLAB X IDE retains the default location of its windows in a file. On rare occasions this file may become corrupt. A corrupt file will present itself by placing the IDE window in odd and unusable locations. If Window->Reset Windows does not restore the window to an appropriate place you will need to Restore MPLAB X IDE to it's original state manually.